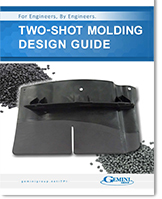 Two-Shot Injection Molded Products | Thumb Plastics, Inc.
Over the past three decades, Thumb Plastics, Inc. has mastered the injection molding process. But we’re more than a mass production shoot-and-ship supplier. Sure, we’re great at producing parts in high volumes, but where we really shine is in combining multiple materials and components in one machining cycle to simplify complex assemblies and enhance the functionality of those parts. We accomplish this through the strategic use of two-shot injection molding, insert molding, and over molding processes. Got an idea for a part requiring the innovation of two-shot? Not sure where to start? Thumb Plastics has the design and manufacturing experience to help solve your company’s product dilemma and give you a competitive advantage. We believe in proactive communication and collaboration early on in the design and engineering phase. This allows us to incorporate DFM right from the start, eliminating potential problems before they add to your cost and development time. Want to build quality and low cost into your product? Put us to work for you!